Scott Lee of www.gofishyourselfak.com shows off a nice catch through the ice. The local lakes will provide foraging fish this time of year. Ice fishing isn&apos;t just for die-hard anglers, however. It&apos;s a great way to get your family active during the winter months, and provides for a fun afternoon with the kids. A number of species are available all winter long, including landlocked salmon, trout, char and pike.The Mat-Su Valley is a great place to get out and explore the lakes in search of lunkers this winter season, as ice fishing is a popular, family-friendly activity. There are a number of easily-accessible lakes that are stocked and provide great opportunities to catch fish locally. A great resource is the Alaska Department of Fish and Game, which has maps of the lakes, including access points, species to target and tactics that work. Another useful resource is Ehmann Outdoors (www.ehmannoutdoors.com), which is run by local residents Buth and Jehnifer Ehmann. Finger Lake, Big Lake and Matanuska Lakes areas are very popular spots for ice fishing in the core area of the Mat-Su Valley, because they provide easy access and lots of action. Farther north there are a number of lakes in the Nancy Lake State Recreation Area that are very popular, and Byers Lake in Denali State Park is also a fun trip. Combine it with a rental cabin from the Alaska State Parks to make it a true getaway, or stay over in one of the many bed and breakfasts in the Susitna Valley for a weekend adventure. 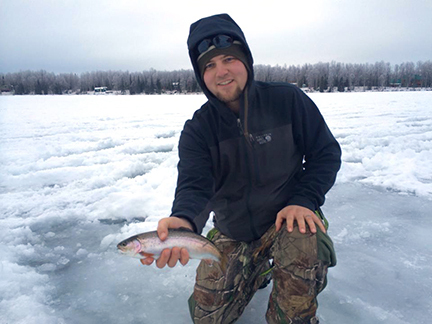 Make sure to mark your calendar for Feb. 21, as the Mat-Su Kids Ice Fishing Derby takes over Finger Lake. This hugely popular event features lots of fishing and instruction, raffles, giveaways and much more. Ehmann Outdoors hosts the event starting at 9 a.m. from the Palmer Elks Lodge on Finger Lake. There&apos;s another derby on March 14 at 9 a.m. at Palmer Elks Lodge to benefit the 477th fighter group. With so many lakes to choose from, chances are you&apos;ll find your own hot spot away from other anglers. Bring the kids, hot chocolate and a quest for fun - you won&apos;t be disappointed spending a day on the "hard water" in search of ice fishing fun.